One word could probably describe all of the above – frustration! However, with the exception of congested roads, we are all probably guilty of one, or more, of the other annoying habits. After all, everyone suffers lack of concentration or tiredness at some point. Middle-lane hoggers are considered selfish by the majority of complainants while a staggering 37% of drivers are not even aware it’s a driving offence – despite the introduction of on-the-spot fines in 2013. 66% of drivers believe the lanes on motorways are designated by speed with the inside lane being for slow traffic, the middle lane for ‘coasting’ and the right hand lane for fast driving. They are unaware of the wording in the Highway Code stating you should move over into the left hand lane as soon as the road ahead is clear. This might help to explain the behaviour of the tailgaters. Might they be thinking that as they are driving faster (often in excess of the legal speed limit) than the car in front, they have the right to be in the ‘fast lane’ and everyone else should be forced to move over to let them pass? Surely, it’s a dangerous belief to hold. So what can we do, as drivers, to relieve the frustration we feel? Getting angry does not solve the problem but adds to the frustration and, thereby, increases the odds of being involved in – or causing – an accident. If someone in front is being a lane hogger, fight the temptation to ‘undertake’ them, or to turn yourself into a tailgater. If the person behind is tailgating you, resist your instinct to frustrate them further by flashing your brake lights or by slowing down. Simply move over when you can, and let them pass. 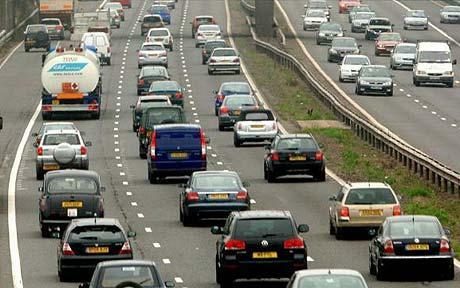 Congested roads cause frustration and are often the result of accidents. Accidents are often caused by frustrated drivers. It can easily become a vicious unsolvable circle. Driving can be enjoyable. All we have to do is take a breath and allow some understanding for others who aren’t the perfect drivers we know we all are! !